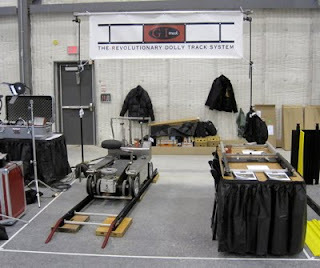 Last week I had the pleasure of manning a booth for GI Track at Toronto's Feb Freeze. It's put on by one of the local's rental / expendable houses. We had all sort of people come by, from students to producers. Of course our favorite people to talk with were grips and being able to show them the latest and greatest. One of the downsides to the show was that it was during the week, but I understand the issues the organizers have to content with. Generally the turn out will be less on a weekend, and during the week people are working. Rough go either way. Gil and I had a great time - lots of great stories shared and bunch of great new faces. I was my first trade show experience, Gil's second and our booth was placed between Mole Richardson and Yellow Jacket Cable Protectors. Those guys had been to all the shows before and were sharing stories with us. Hilarious! Thanks for the write up. Looks like a cool show. 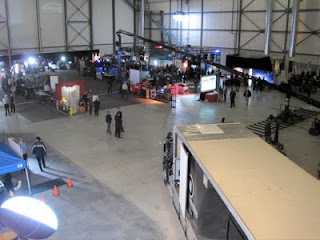 Of the 20 - 30 booths there, all but 2 were 10x10, and those two belonged to the show runners. 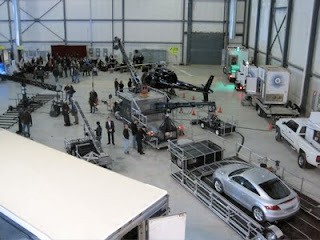 Since the show runner deals mostly in video and sound, there was alot of video cameras - with 3D being a big topic. All the cranes & camera cars belong to the show's supplier (Whites.com). In this kind of show, there are lot of cables on the floor that is need to be organized well so that there will be no chance for some problems to be occur like de attaching of wires or stripping it off. It is a need to use such as cable protectors in this kind of setting. Nice dolly on that there track :).